It was important for me to dedicate this novel to my father because he was critical in the development of my faith, though in subtle ways. I have very clear memories, for example, of my dad reading the Bible every night in bed (he often read out loud so my mom could hear). While I was growing up, every Sunday morning he would go downstairs to our icon corner and pray, then bless the house with his censer. Every Sunday, he and my mom would go to the Divine Liturgy (we, his children, refused to go for a long time, and though they tried to insist at first, they eventually stopped). He fasted every Lent and throughout the year (he never forced us to do that with him either). He turned to God when faced with adversity and, a rarer quality, turned to Him with gratitude when things were going well. He forgave freely, reaching out in love (sometimes again and again) to those who hurt him or even despised him. As a teenager, I often argued with my dad over matters of faith (I think usually just to provoke him). But he was never provoked; he’d calmly state what he believed and was content to let me think things through on my own and in my own time. For a teenager who thought there was nothing more important in a debate than proving your position was the right one, that kind of quiet self-assurance about his faith spoke louder than any arguments could have. This idea of making one’s home a little church comes from the great St. John Chrysostom, and both my dad and my mom took his advice to heart. In addition to the things I’ve already mentioned, their house was always open to our friends and they were constantly hosting people for dinner. They also filled their home with beautiful icons and crosses in every room. And now that their kids are grown up and have kids of their own, that example of hospitality, of adoring God, of turning to Him in good times and bad, of participating in a community of faith, of placing prayer at the center of one’s day, of loving forgiveness, is being passed on to a whole new generation. And now the third and final part of Chapter 1 of A Devil’s Gospel. (Check out Monday’s and Wednesday’s posts for the first two parts). One day Satan found me walking along the shores of the fiery lake. “I guess so, yes,” I said, anxious for him to get to his point because I felt so uncomfortable speaking to Satan, especially alone. Satan kneeled over the lake and stared into it, as if it were a mystery he wanted to solve. For a moment, I thought of lying. But I knew that eventually word would get back to Satan; I’d been the most vocal person reminding anyone foolish enough to repeat Satan’s words that in fact we’d been defeated in a spectacular way, and that when the fearsome Lucifer-Dragon fell like a bolt of lightning, Michael was left standing. “Yes, we lost,” I said. “It was the only war,” I said. “A plan for a second war?” I said. I followed his shift to the throne room. Satan called for his angels to gather; I don’t think it was lost on him that they assembled more slowly than the last time he’d called them together, or that more of them were moaning with every step and that a few were even crawling again. With that, and without waiting for a response, he disappeared. Some energy seemed to have flowed back into the assembly. The dark angels bombarded each other with questions and theories and suspicions. I was closed off to some of the conversations—as much as Satan believed that his angels trusted me, most of them also sensed that there was something different about me, which led to a certain degree of suspicion. I did my best with the conversations that were open to me, jumping in when the focus shifted to the first war and its failures, reminding my brothers that this was a new war and that it seemed to me Satan knew what he was doing. I have no idea how confident I sounded. The talk went on for a long time, but before any of the conversations had wound down, I became aware that Satan had reappeared, and was sitting on his throne, watching and listening. He looked different; taller and fuller, but also darker than before. The little light that had still existed in him seemed to have been completely swallowed up. If he’d been fearsome before, he was terrifying now. A few other dark angels became aware of his presence, then many more, then everyone and the silence was complete. A now-familiar smile spread across Satan’s face; a smile fueled not by humor or joy but by anger and lust; a smile whose only pleasure is the suffering of others. That’s it, the first chapter of A Devil’s Gospel. Tune in on Monday for a glimpse into who this novel is dedicated to! Chapter 1 of A Devil’s Gospel continues below (see Monday’s post for the first part if you haven’t read it yet). The angels cheered once more. There were yells for Lucifer to waste no time in speaking to God and asking for a dimension of our own. Lucifer put up his arms to silence them; his glow was angry, though he tried to restrain it. Looking around, it seemed to me that there were fewer angels now than when Lucifer had first welcomed us. “You’re either with me or you’re against me,” Lucifer said, and his appearance began to change. He grew, taller and taller, towering over us several-fold by the time he stopped. Of course now we would recognize it as the dragon, scaly and metallic and breathing fire, that has haunted the fantasies of the fallen, but at the time none of us had seen anything like it, and we were mesmerized. I did it, of course, tearing apart the hall that I’d built and reshaping the broken pieces into one sword after another. I worked in a daze, so quickly that I didn’t know how many weapons I’d already made and how many were left to make. At one point I noticed that most of the armed angels had been led away by the dragon. The remaining angels followed one at a time, leaving as soon as I handed them a sword. Much later, when the hall lay in ruins around me, and only a handful of angels were left, Moloch shifted in, looking haggard and pulsing a dull, pained glow. We followed Moloch, the handful of us who hadn’t yet picked up a sword and probably weren’t too keen on getting one anytime soon. We arrived in a higher dimension of Heaven to a scene of pure chaos. Sparks of lightning flew from swords as they crashed against each other; angels grappled and struck at other angels, causing bursts of fire to erupt when their fists made contact. Towering above all was the Lucifer-Dragon, swiping his tail and breathing fire in a mad, angry attempt to damage someone or something. Mesmerized, I watched Michael dodge the dragon’s attacks. Beelzebub rushed at him, but one of Michael’s troops—Gabriel, maybe, but it’s so hard to remember now—dove between them and knocked Beelzebub to the ground, landing on top of him. I didn’t know who spoke or even if it was one of Michael’s angels or one of Lucifer’s. Beelzebub threw Gabriel off of him, then picked up his sword from the ground and swung. Gabriel stepped into the attack, grabbed his arm, and snapped it. In one motion, he grabbed the falling sword and plunged it into Beelzebub. His scream at that moment was like nothing I’d ever heard before. Squealing, desperate, pathetic, he yelled in pain and agony, then burst into flames. The sight and sound was horrible, and soon I saw and heard it repeated throughout the battlefield as more of Lucifer’s angels were overthrown by Michael’s soldiers. It was Abaddon, and he was already charging at Michael. I ran after him to pull him off course—what was the point of this madness? We’d already lost, I knew; it was time to lay down weapons and suffer the consequences. Abaddon cut down an angel on his way to Michael, but another appeared in his way. I was so focused on Abaddon that I didn’t realize someone was standing in my way too; in my panic I struck with my sword, connected. 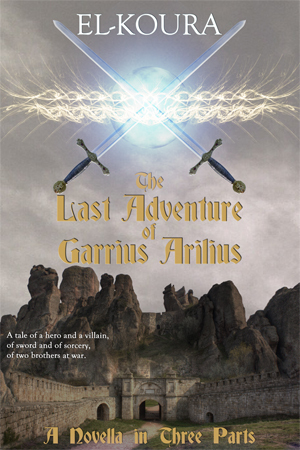 Jegudiel fell back, but reached forward almost immediately and wrenched the sword from my hand. Before I could move, he plunged it into my chest. The pain was so powerful that for a moment I didn’t make a sound. Then I felt my entire body turn to fire and, unconscious of anything but the anguish and the terrifying feeling that my very existence was being consumed, I screamed. Slowly, although the pain didn’t subside, I became conscious of something else: I was sinking, falling, as if the fire had burned away my substance and I was no longer solid enough to stand. Before I could have another thought, an explosion like lightning blinded my vision, but I didn’t need to see to know what had happened; Lucifer was overcome, struck down by Michael’s fiery sword. I felt myself slipping further and tried to scramble to keep my footing. But it was impossible, and I fell through the dimensions, screaming in agony and convinced that I was being annihilated. “Have mercy, Lord!” I cried, but I knew it was too late. It will infuriate Lucifer to learn that even in those first few moments of defeat, I begged for God’s mercy, but I don’t care. What more can he do to me now? No one realizes, or at least no one remarks on how we have gradually come to use the words of the fallen to understand ourselves, even to understand and describe half-remembered events that occurred before the fallen were created. We’ve lived among them for so long now that their very concepts and images have become our own. I suppose we thought—certainly Lucifer thought—that influence and persuasion could flow in a line with a single direction from us to them. But can any of you listen to yourself speak for a moment and deny that they have influenced us just as much as we’ve tried to influence them? I remember nothing of what happened next, nothing until I awoke some time later, feeling dazed and groggy, to borrow three more concepts from the fallen. I wasn’t sure where I was, not because I couldn’t see but because I saw everything as if through a fog. I stumbled to my feet. Shadows passed over me. “Hello?” I said, and suddenly I became aware of the sound of wailing coming from all around. I tripped over something and fell to the ground. The fog started to clear, or I grew accustomed to it. A creature crawled on the ground next to me. There was no point in continuing to speak. Beelzebub had forgotten about my presence and returned to wailing and crawling, half-blind, searching like the others for something that would quench their agony and ignoring everything else, including one another. Before us stretched plains of dark, craggy rock. As my vision cleared, I saw a lake on fire and walked toward it. The lake burned and bubbled, and as I stood on its shore, something reached out and grabbed my ankle, burning me with its excruciating touch. But suddenly a head emerged from the fire. The once-luminous angel of God used my body to pull himself out of the lake. Finally he stood before me, charred and ugly, not equal to the shadow of the creature he used to be—not that the creature he used to be had ever cast a shadow. “Don’t call me that anymore,” he said, his voice soft and distant and choked by pain. He looked past me, over my shoulder to the pathetic sight of the crying, crawling remains of his army. The dark angels pulled themselves together and, one by one, walked or crawled toward Lucifer, who stood backlit by the small explosions of the fiery lake. They looked around, and saw what Lucifer wanted them to see. In a loud and happy voice, he told us that the pain we currently felt was the Enemy’s one parting shot; he told us to think about the agony He must be in to have lost his greatest angels; and when finally he said “We won, brethren! We won!” a great cheer went up, although it sounded more like screaming than cheering. I sang, but nothing happened. I sang again, more insistently, then more desperately, but still the rocks didn’t respond. I did my best, directing the dark angels like a colony of ants. Some pieces could be used as they were brought to me; others needed to be smoothed out in the fiery lake; still others could be combined by smashing them into one another. Soon I had everyone separated into groups of gatherers and smoothers and smashers. We worked in a frenzy while Lucifer watched with thinly veiled impatience. When construction was complete, we had a structure that looked nothing like the Enemy’s palace, consisting entirely of a throne room that was barely worthy of the name. As the dark angels chanted the new name of their new leader, Satan sank back into the chair, looking comfortable and pleased with his throne and his castle. Through thousands of years, we’ve rebuilt that chair, and the room, and the palace. We’ve added levels above and below, and rooms all around. And when Satan asked me to design and build a dungeon far beneath everything else, I carried out his order and had no idea that he was making me build the place where he planned to imprison me. Tune in on Friday for the third and final part of this chapter! It all started with a man and a woman. Did we think He-Who-Rules could do it, even after he’d failed so spectacularly? We all did, each of us for our own reasons: because we wanted the relief that his success brought, or because it was so much fun to torment them, or even because some of us came to really believe the lie he told us, that we could be victorious against Him after all. Did the Enemy have this planned all along? That question tortures me above all else, tears me apart from one end of my being to the other, and is worse to me than anything He-Who-Rules can do. Did we ever have a chance? It’s a silly question, isn’t it? Some of the fallen ask this other silly question: can the Enemy create a stone so heavy that even He can’t lift it? Before the First War, He-Who-Rules asked us something similar, and at the time it didn’t seem silly but very serious. We met in a hall I’d sung myself. I think that bit was on purpose, though I never thought of asking then or since, and now it’s too late. Few of us remember those days, but I’ve never been able to forget. I’d been reshaping an old castle I’d built long ago, singing it into a more rounded style that I thought was different and would please my friends, when suddenly I became aware that I was being watched. “Lucifer sends me,” Moloch said. “I said Lucifer sent me,” Moloch interrupted, smiling, “not God.” He whispered a location in one of the lower dimensions, but it wasn’t until I shifted there that I realized we stood in one of my old songs. “Welcome, brethren.” Lucifer shimmered the lightest blue, his glow more radiant than any angel I’d ever known, and yet duller than usual. To look at Lucifer was always an experience, but even then I noticed a difference—as if he stood behind a thin wall of smoke. The Transformation had already begun, I just didn’t know it yet. His voice was as strong and commanding as ever, and it projected across the entire hall. I didn’t understand what was happening, or why we were meeting in secret, in a dimension I’d used to practice my songs. I didn’t understand, but I didn’t like the way it made me feel. I looked up, startled. The room was empty except for Lucifer and I; it was a trick he had and still has, to make you feel that he’s speaking to you alone in a room full of people. His eyes, green and luminous, bored into me. In those eyes I’d always read judgment and criticism, or perhaps I equated how intimidated Lucifer made me feel to the inadequacy that always accompanied it. “To rule over them?” I said, surprised. I did, but kept the thought to myself. Suddenly the room was full again, packed with the other angels I’d seen before, angels whose eyes were fixed on Lucifer. I didn’t know what he meant, but presumably the others did because they cheered. As he spoke, the angels cried out their support and excitement. Again I felt that we were alone and that the distance between us had collapsed. Lucifer stood so close that I could feel the sense of disappointment radiating from him. Tune in on Wednesday for the second part of this chapter! Earlier this week I revealed the ebook and paperback covers for A Devil’s Gospel. The image on the front cover is of what’s commonly referred to as the Trinity icon, by the Russian painter Andrei Rublev. Its significance will be the subject of a future blog post in this series (as will the story of why it took so long for me to get A Devil’s Gospel into print). Stay tuned for that; in the meantime, check back next week for the full text of Chapter 1 of the novel, starting with the first part on Monday. On Monday of this week I revealed the cover art for the ebook of A Devil’s Gospel. Like with the ebook, I designed the cover with input from my wife, and incorporated a beautiful image from Pixabay released into the public domain. The family photo on the back cover was taken by the excellent Christine at Urban Bent Studio. Let me know what you think in the comments below and tune in on Friday for a bonus cover! A Devil’s Gospel: Cover reveal! The theme of this week’s posts on A Devil’s Gospel is cover art! (Click that link to reach the book’s landing page, where you can see all the previous blog posts in this series). I designed the cover (with input from my wife), and incorporated a beautiful image from Pixabay released into the public domain. What do you think? Let me know in the comments below and tune in on Wednesday for a sneak peak at the paperback cover! On Wednesday of this week I revealed my new novel’s table of contents, and I also said that one of the great bits of fun about writing it was titling the chapters. But the best part of writing the novel was discovering, rediscovering, exploring how Christ’s shadow falls on just about every page of the Old Testament. I’ll talk more at length about this in a future post (which will include a lengthy excerpt from the novel), but for now let me give one example, also excerpting from the novel. “One day after the end of the growing season, Cain and I came upon Abel and we watched him from afar. He picked out the best lambs in his flock and slaughtered them, which wasn’t unusual in itself. But then he set aside the best parts and burned them. ‘Your brother has gone mad,’ I said. “But of course Abel had plenty of words to justify his actions. ‘The lamb was a sacrifice to God,’ he said. “‘To erase this debt you feel you owe Him?’ I had Cain say, in the condescending older-brother way we had perfected through the years. [We] couldn’t understand what Abel was doing, I remembered, when he offered to God the life of an innocent lamb. To be truthful, none of us understood the point of all the sacrifices, why the blood of countless animals was poured out on the altar and enough grain to feed the populations of the world a hundred times over burned up. The point was to point to You, wasn’t it? I thought, looking at Him. Nor could we understand why God’s people had to give up the best of what they had, but that answer now seemed as obvious as the first. All of a sudden, something hazy and indistinct (there does seem to be a meaning to all of those sacrifices, but within the context of the Old Testament, it’s hard to be sure what it is) becomes obvious and solid when seen through the lens of the New Testament. That’s why the first book in A Devil’s Gopsel, which covers the Old Testament period (roughly), is called “Shadows” and the second book, which kicks off when Jesus enters the scene, is called “Substance.” In the lengthier excerpt I mentioned above, I’ll share what I think is the most surprising thing about the Bible, which ties into this theme of Shadows and Substance. That’ll be in a few weeks. Next week we’ll turn to some cover reveals (yes, a series of them). Tune in on Monday for the first! 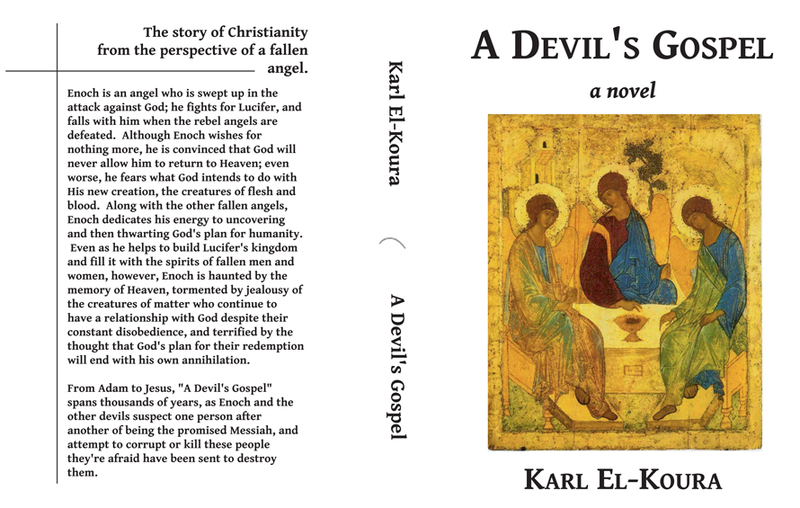 Last Friday I announced the upcoming release of my novel, A Devil’s Gospel, on Palm Sunday this year, and this past Monday I revealed the novel’s blurb (description). Today I want to talk about how the novel is structured. It consists of two books: the first (called “Shadows”) generally covers the period contained in the Old Testament (as we Christians refer to it), and the second (called “Substance”) covers the New Testament period, around the life, death, and resurrection of Jesus of Nazareth. A pretty natural division for my novel, since the Bible itself is likewise divided! Each book consists of (did you guess?) twelve chapters. Like the number two (there are two testaments and two covenants; Christ has two natures, divine and human; etc. ), twelve is a very important number in Judeo-Christianity, primarily because of the Twelve Tribes of Israel and (their parallel) the Twelve Apostles called by the New Israel, Jesus Christ. Why I called the first book “Shadows” and the second “Substance” will be the subject of this Friday’s post! 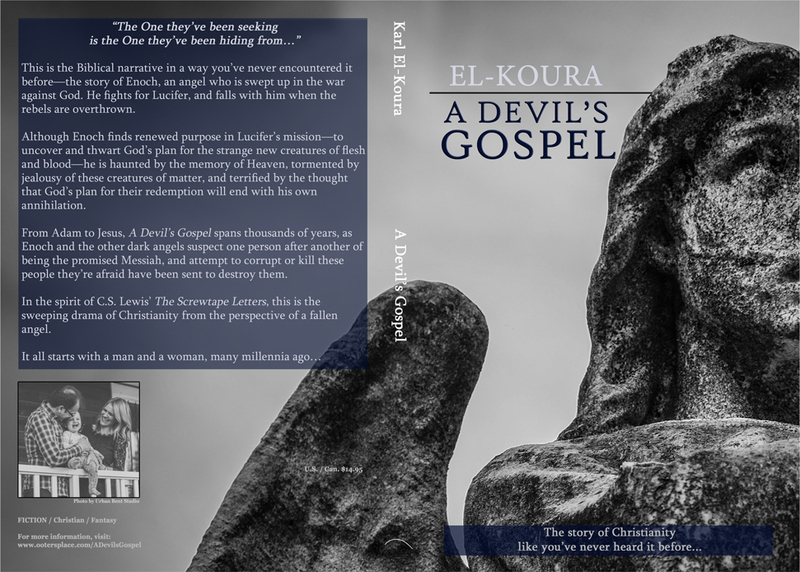 A Devil’s Gospel: Blurb reveal! 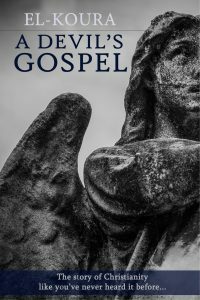 Last week I announced the upcoming release of my novel, A Devil’s Gospel, on Palm Sunday this year. Today I’m pleased to share the novel’s “blurb” (description) with you. Let me know what you think in the comments below! Tune in on Wednesday, when I’ll share with you how the novel is structured (and why). (To play along, try to guess how many books the novel is divided into, and how many chapters each book consists of).